1. The Beatles are, without a doubt, my all-time favorite band. 2. I currently own at least one Beatles T-shirt. 3. I own or have owned a Beatles board game. 4. I have The Beatles: Rock Band video game. 5. I have every Beatles song on record or CD. 6. I bought each new Beatles album the day it came out. 7. I belonged to the Beatles Fan Club. 8. I saw A Hard Days Night at the theater. 9. I saw Help! at the theater. 10. I saw Yellow Submarine at the theater. 11. I saw Let It Be at the theater. 12. I saw John in concert. 13. I saw Paul in concert. 14. I saw George in concert. 15. I saw Ringo in concert. 16. I saw all four Beatles in concert. 17. I've never missed a solo Beatle's concert in my area. 18. 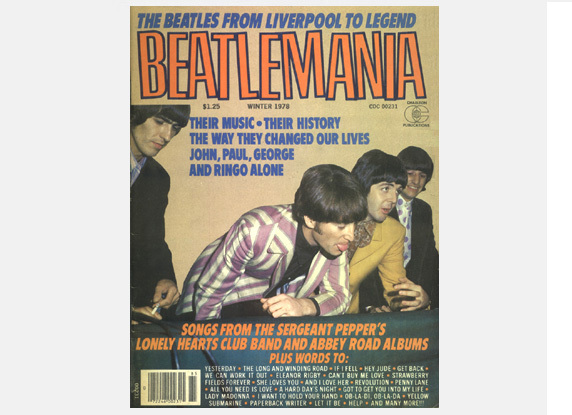 I've seen the musical, "Beatlemania." 19. I've seen "LOVE" by Cirque du Soleil. 20. I saw a Beatle up close. 21. I met a Beatle. 22. I have a Beatle's autograph. 23. I had at least one dream about the Beatles. 24. I have/had Beatles posters on my walls. 25. I played a Beatles song this week. 26. I played a Beatles song today. 27. I had a Beatles haircut. 28. I wore Beatle Boots. 29. I wore John Lennon glasses. 30. I wore a John Lennon hat. 31. I own a Beatles key chain. 32. I own a Beatles magnet. 33. I currently use a Beatles calendar. 34. I have a large supply of Beatle videos/DVDs. 35. I read at least one Beatles book, cover to cover. 36. I have attended a Beatlefest or other Beatles convention. 37. I own a Beatles mug. 38. I have or had Beatles trading cards. 39. I have or had Beatles bobble head dolls. 40. I have or had a Beatle-ly license plate. 41. I had a Beatle lunch box. 42. I like to quote lines from Beatles movies. 43. I played in a Beatles tribute band. 44. I went to Liverpool to see Beatle sites. 45. I named one one of my children or pets after a Beatle. 46. I like to talk with a Beatles accent. 47. I bought a guitar similar to a Beatle guitar. 48. I have a Beatles tattoo. 49. I underwent plastic surgery to look like a Beatle. 50. I legally changed my name to "Ringo Starr."